The details are irresistible: a childhood spent selling doughnuts for loose change; the father whose most memorable contribution to Pacquiao’s upbringing was the time he ate the boy’s dog; stowing away on a ship to Manila as a 12-year-old; working construction between training sessions at a decrepit boxing gym in Malabon City; having barely enough money to feed himself, and then stuffing his shorts with ball bearings to make the minimum weight of 106 or 110 pounds in his earliest fights. 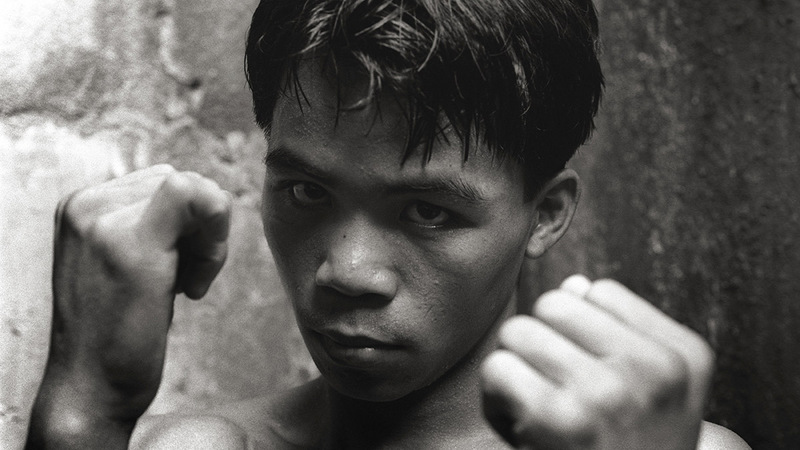 From those circumstances emerged the greatest Filipino athlete of all time, a surefire boxing Hall of Famer, and $335 million in career in-ring earnings. 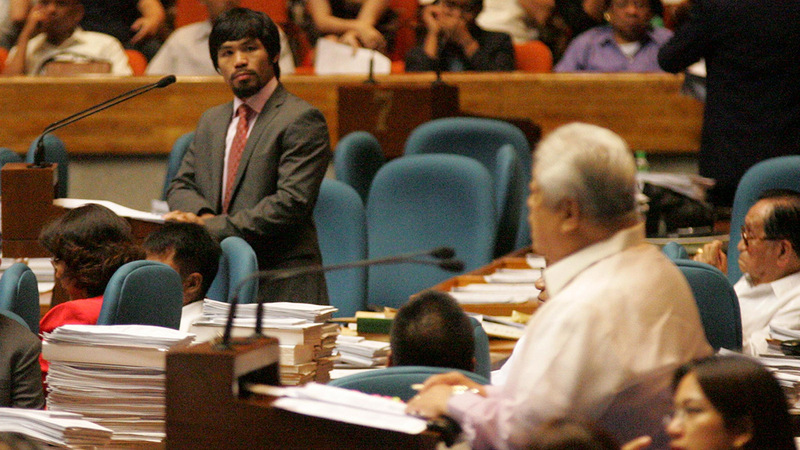 Then, the extracurriculars: Pacquiao’s ham-tastic recording career, his forays into film acting and variety show hosting, his wish fulfillment turn as player-coach in the Philippine Basketball Association, and, for better or worse, his status as a sitting congressman in his home country, with eyes on a Senate seat in 2016. The athlete who rises from humble beginnings is a common story in sports, so well-trodden that it might obscure just how improbable Pacquiao’s journey has been. 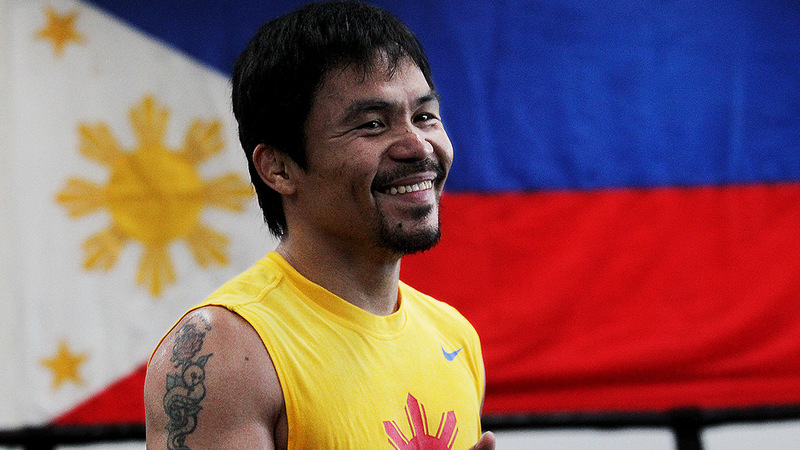 Millions of Filipino boys are born into nearly the exact same circumstances as Pacquiao was. Financial burdens drive them out of school somewhere around the sixth or eighth grade, so they start working — maybe fishing, maybe sorting scrap metal in a junk shop. Life plateaus right there, unless illness or injury or typhoons make it worse. There have always been exceptions — athletes, entertainers, businessmen, and even artists who manage to break the cycle of poverty. Pacquiao is one of them, but because of the scale and drama with which his story has unfolded, he is more. By my count, there have been at least three biographies, two feature films, and one documentary based on Pacquiao’s life. His career is too enormous to capture in an article, but by pointing to the milestones and shading in some background about his dips into entertainment, basketball, and politics, we can develop a more fully rounded image of the fighter — just how remarkable his boxing career has been, and how his side pursuits could someday paint a dark chapter in the fable of Manny Pacquiao. Suntukan is the Tagalog word for a punchout. In Manila, if you hear someone shout “Suntukan na!” it means that a rumble just broke out. And when you dig up video from Manny Pacquiao’s first years as a professional, that’s the style of reckless brawling you’ll see. Pacquiao was a fighter long before he became a boxer. Watching Pacquiao in his late teens stomping after opponents with his left hand cocked and destruction in his eyes, it’s very difficult to imagine him developing into even a decent boxer, let alone one of the most dynamic offensive fighters of his generation. He lunges behind his powerful straight left, charges chin-first into counterpunches, and bullies 5-foot flyweight sparkplugs into the ropes to whale on them. Boxing fans like to joke that rising prospects tend to get matched against tomato cans — construction workers or taxi drivers who are willing to take a beating for a couple of bucks and a hot meal. Well, many of Pacquiao’s early opponents were indeed no-hopers, except that at the beginning of his career, Pacquiao was a construction worker, too. In the Philippine TV broadcast of his seventh career fight, the broadcast team explains that Pacquiao’s promoter hadn’t bothered hiring a dedicated trainer for the teenage southpaw until before that matchup — meaning that even Pacquiao’s handlers couldn’t have expected much from him at first. Twenty years ago, when he was delivering unrefined poundings to guys like Dele Decierto and Rolando Toyogon,1 fighting in sweatbox municipal gymnasiums before crowds of a few hundred people, was there any way to predict that he’d one day challenge the greatest pure boxing talent of his era? That he’d costar in the richest fight of all time, at the MGM Grand in Las Vegas? No. Never in a million years. But even then, there were moments when Pacquiao flashed his breathtaking power and talent. Take his eighth bout, against Renato Mendones. It was not uncommon in those days for Pacquiao to be outboxed early in fights — even against mediocre talent — and that had been the case against Mendones. But after a sloppy exchange in the second round, Pacquiao broke free and circled to his left with his hands down. Two or three steps, then he stopped on a dime, planted his feet, and drilled a left through the middle of Mendones’s guard. The punch was electric — a precursor to the left that erased Ricky Hatton in 2009 — and it put Mendones out on his feet, a sitting duck for Pacquiao to finish the fight. The other unbelievable bit is that Pacquiao kept winning with this style, even as he rose in weight and began to face world champions. Fighters like Ledwaba and Barrera, whom Pacquiao beat in 2001 and 2003, respectively, were expected to have enough experience and skill to dissect Pacquiao’s one-dimensional attack.2 But the veteran fighters couldn’t handle his speed, aggression, and stamina. Pacquiao’s feral pursuit never let up. He just kept pursuing his opponents and hammering away with the left until he overwhelmed them — even more pedigreed boxers. Pacquiao’s limitations were plain to see, but since he’d moved up from flyweight, no fighter had been able to exploit them and win — until he finally ran into Erik Morales. Before then, Juan Manuel Marquez had managed to adjust to Pacquiao’s speed and power and dominate much of their first fight in 2004, but Marquez’s adjustment came after he’d already been knocked down three times in the first round, and the fight ended in a draw. Still, Marquez had exposed a way to beat young Pacquiao: He stayed just out of range of Manny’s straight left, then riddled him with counters every time Pacquiao lunged forward with the punch. Marquez made Pacquiao think twice about uncorking his greatest weapon. Less than a year later, Morales executed a similar game plan and earned a hard-fought but clear decision over Pacquiao. 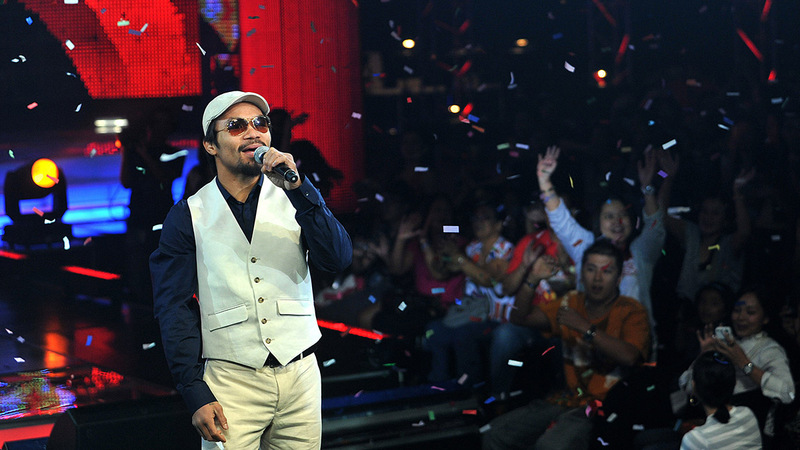 The suntukan days had ended for Pacquiao. If he didn’t develop his right hand and improve his defense, he’d likely be remembered as little more than a fun flash of southpaw power. Pacquiao-Marquez I and Pacquiao-Morales I are classics; there’s no way to call the Hussein fight the best of the era. But its relentless pace and constant action are characteristic of young Pacquiao. Plus, Hussein is a bona fide madman — one of the dirtiest fighters you’ll ever see — referee Carlos “Sonny” Padilla puts on a master class in officious showboating, and Pacquiao digs deep to recover from a Round 4 knockdown that appears to briefly make him go cross-eyed. The whole fight is grimy, weird, and great. Before Pacquiao signed with Nike, few looks captured early-’00s goofy badassery like Manny’s flame-patterned shorts, Backstreet Boys center-part hair, and that “No Fear” headband. From an American point of view, Pacquiao’s goofball side gigs in music and film may seem like the megalomaniacal whims of a star who believes he can do anything he wants. That’s not quite the case. Pacquiao’s off-key monster ballads and incoherent superhero flicks are part of the natural progression of Philippine celebrity. If an athlete becomes famous enough, eventually he’ll have opportunities to embarrass himself on the screen or in the recording studio. Last year, former PBA most valuable player Arwind Santos released an album; like Pacquiao, he’s no singer. Decades before Pacquiao was giving it a go as a leading man in action movies like Anak ng Kumander and Wapakman, basketball stars Robert Jaworski and Francis Arnaiz were chasing down slimeballs in a TV police procedural called Manila Files. The catalogue of schlock culture produced by ballers and boxers is deep, a steady trickle of uncarried tunes and wooden dialogue over the years. Pacquiao’s contributions to this canon will be remembered like the others: as something for sports fans to joke about over skewers of charred chicken intestine and buckets of Red Horse beer. That quote — “There’s no other like you, Manny!” — comes from none other than Erik Morales, who traveled to the Philippines to toast Pacquiao in a San Miguel Beer commercial after being knocked out by his Filipino rival in the second and third bouts of their super-featherweight trilogy. The Pacquiao who came to the ring for the second Morales fight in January 2006 was a near-complete version of the offensive force he would become — a “screaming fistic dockyard marvel,” to borrow a phrase from Philippine sportswriter and poet Recah Trinidad. “Manila Ice,” the atrociously named right hook that Freddie Roach had promised Pacquiao would debut in the first Morales fight (and which never materialized in the loss), finally emerged in the rematch. Pacquiao, now with speed, power, and accuracy in both hands, wore down Morales over 10 rounds and became the first opponent to knock out the Mexican legend. Ten months later, it took only three rounds for Pacquiao to earn an even more decisive stoppage over Morales, who simply sat with his arms around his knees and shook his head while he let the referee count him out after suffering his third knockdown of the fight. This period was Pacquiao’s first prime and the stretch in his career that gave fans the purest look at his peak fighting form. It came before he’d reached superstar status and before his historic barnstorming of the higher weight classes, but as a 130-pounder, Pacquiao was a blur of fury and precision, darting in and out of range with rat-a-tat combinations. He would improvise punches that, seemed sublime. This was also the sweet spot in Pacquiao’s postfight-interview career, when he felt confident enough in his English to show some personality but was still capable of dropping unintentional one-liners that would send the entire Philippines into hysterics. The most famous example was the way Manny transformed Cleto Reyes, the name of his preferred brand of gloves, into an accidental reference to female anatomy, but I’m partial to the time he was asked about his state of mind when Marquez hurt him in their second fight, and Pacquiao answered, “That is … psychological,” and then chuckled in delight at his own vocabulary. One factor that made this period so enjoyable was that Pacquiao faced smaller, quick opponents who weren’t hopelessly overmatched by his hand and foot speed. It was certainly impressive when, later in his career, Pacquiao danced circles around stiff-legged larger men, ripping them with shots from waist to temple. But those one-sided deconstructions often lacked for drama. When he was fighting at super featherweight, Pacquiao’s battles tended to have more ebb and flow. Rivals like Morales and Marquez weren’t quicker than Pacquiao, but they were fast enough to respond to his combinations with counters and flurries of their own. Manny’s best fights at this weight contained wild swings in momentum, rallies from both fighters, and victories that seemed in doubt until Michael Buffer had read the very last scorecard. My favorite of their four fights. The final installment, which ended with Marquez’s shocking, unsettling, and downright perfect one-punch knockout of Pacquiao, is the most significant and perhaps, thanks to its three knockdowns, the most dramatic. But I still prefer the 2008 edition, when Pacquiao and Marquez were fighting at the lighter weight, maintaining a blistering pace and forcing fans to hold their breath for three minutes at a time. They brought out the absolute best in one another: Manny’s ferocious, unpredictable attacks pushed Marquez’s counterpunching to brilliant heights. Before the fourth fight, Pacquiao and Marquez had gone 36 rounds without a clear winner. I’ll take the middle 12 as the finest of them all. While Pacquiao’s clumsy forays into music and movies are part of a larger tradition of Filipino sports heroes moonlighting in local pop culture, his recent participation in the Philippine Basketball Association as player-coach of the Kia Carnival expansion team is unprecedented in the league’s 40-year history. Pacquiao’s outside shot is about as pretty as his singing voice, but that hasn’t stopped him from parachuting into the PBA. There are two ways to look at this. You can call it an embarrassment — and several PBA fans have done just that. You can point to Daniel Orton, an American import player whose team replaced him partly due to disparaging remarks he made about Pacquiao, and the jeering coverage the kerfuffle received in the international media. You can argue that Pacquiao has turned the PBA — a deservedly proud institution — into a punch line for the rest of the world. You can complain that Pacquiao, the richest athlete in the country, is taking a roster spot from a better player who needs it much more. Here’s the other side: Who cares about the Orton controversy? It’s no secret that his team wasn’t terribly disappointed to see him go, since it allowed them to rehire a former PBA Best Import award-winning center who wound up leading them to the league semifinals. Yes, Pacquiao’s roster spot could go to a more skilled player, but Kia might not have been willing to join the league if the company hadn’t been allowed to install Pacquiao as player-coach. That means for the one job he’s taken, Pacquiao could be credited with creating a dozen or so more on Kia’s active roster. The PBA might have been initially wary of allowing Pacquiao to play — that’s certainly one way to read the league’s insistence that Pacquiao go through the draft when Kia had preferred to hire him directly as player-coach. That could have been the PBA’s gentle, unspoken attempt to convey the message: Manny, please don’t put us in this position. But Pacquiao, as a sitting congressman, a leading endorser for many businesses’ own PBA teams, and the most famous man in the country, was not someone the league could openly deny. Once he agreed to go through the draft, he was in. 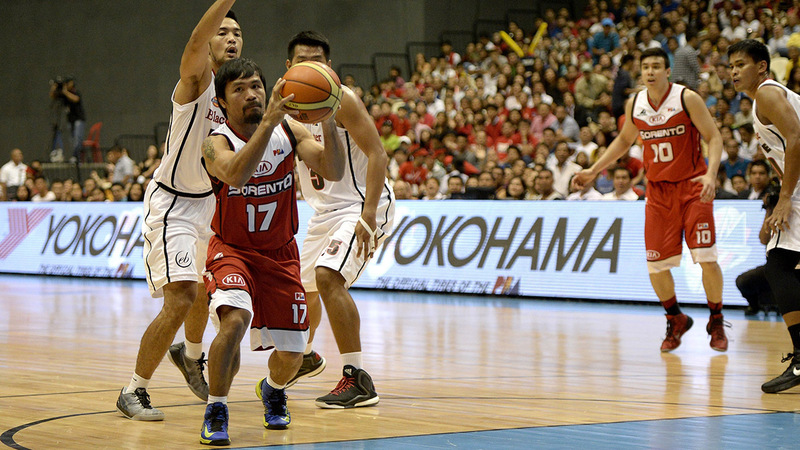 And then a funny thing happened — fans went crazy over the wackadoo novelty of seeing Pacquiao in a PBA jersey. His first game drew more than 50,000 fans, and sellout crowds have been the norm on game days when Pacquiao decides to suit up. When he checks himself into games, crowds explode into howls of delirious joy whenever he touches the ball. Manny is a hit, and the league is enjoying a welcome boost in popularity thanks partly to him. Sure, there’s something gauche about how Pacquiao has nudged his way into the league, but it’s hard to argue with success. If the league is happy, the players are happy, and the clamoring majority of fans are happy, then business is good and Pacquiao will be welcome in the basketball world for the foreseeable future. This is the period in which Pacquiao rose from super featherweight to junior middleweight, winning title belts at every weight class along the way. It’s also the stretch in which he ranked as boxing’s second-biggest pay-per-view draw and second-best pound-for-pound fighter, behind Floyd Mayweather. But for all of Pacquiao’s triumphs in these years, no moment sticks out like the instant in which a straight right hand from Juan Manuel Marquez appeared to have erased it all. Pacquiao’s exploits during these years are well known, so let’s blaze through the specifics: He knocked out David Diaz, who got up looking like he had gone nine rounds with a wood chipper; then Manny sent Oscar De La Hoya into retirement and used the Highlander-like transitive property of boxing fame to seize Oscar’s superstar status. Pacquiao sent Ricky Hatton back in time with a single left hand, he left a sad, pummeled Miguel Cotto drooping in referee Kenny Bayless’s arms, and then he double-punched Joshua Clottey. He performed a minor surgical procedure on Antonio Margarito’s right eye, knocked down Shane Mosley once before coasting to an uneventful win, and then scored a disputed decision in his third fight with Marquez, in which many observers felt Marquez had finally gotten the better of Pacquiao. As Manny’s win streak wore on, a pair of myths about the direction of his career took hold in the boxing public’s mind. The first concerned Pacquiao’s alleged use of performance-enhancing drugs; the second posited that Manny might be losing his “killer instinct.” I call them myths not because I know them to be false but because there’s no way to know if they’re true or false. Talk of the supposed decline in Pacquiao’s fighting spirit stems from several factors — that he hasn’t knocked out an opponent since 2009; that he seemed to show mercy against a clearly beaten Margarito; that Margarito’s punishing body punches took some of the fight out of Pacquiao; that Pacquiao chose to cruise to wide decisions against Clottey and Mosley instead of hunting for stoppage wins. But it’s not quite that simple: Margarito’s corner or referee Laurence Cole probably should have stopped that fight long before Pacquiao eased up, and boxing his way to an easy decision might be seen as a sign of maturity in a boxer other than Pacquiao, whose reputation as a tireless dervish of destruction colors the way fans see his fights. Even so, there’s no way to look back at the end of a bout like 2003’s Pacquiao-Barrera I without wondering, When was the last time we saw that bloodthirsty madman? Whatever the reason, Pacquiao fell back into cruise control when he seemed comfortably ahead in his 2012 fight with Timothy Bradley. He paid for it, however, when the judges’ scorecards awarded Bradley a hugely controversial win by split decision. It took Pacquiao’s greatest adversary, Marquez, to coax out Manny’s dormant viciousness. Dropped in the third round by a wicked overhand right, Pacquiao rose from the canvas, banged his gloves together, and came after Marquez like it was 2004, when Manny had floored Marquez three times in the first three minutes they’d ever shared in a ring. Near the end of six rounds of trading fury, Pacquiao stutter-stepped to set up a straight left before the bell, and … emptiness. ’Boy, ’san ka? Ano nangyari? Tapos na ang laban? “’Boy, where are you? What happened? Is the fight over?” When he came to, those were Pacquiao’s first words to assistant trainer and longtime friend Buboy Fernandez. In the minute or so that passed between the knockout and when Pacquiao spoke, the notion that Manny’s entire career might be over had already bloomed in the minds of the million-plus people who watched the fight. 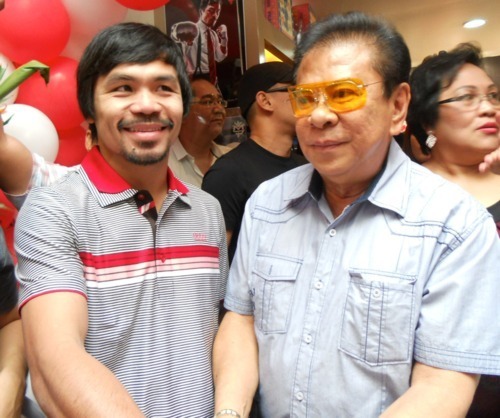 Outside of the ring, I can’t think of a more admirable moment in Pacquiao’s career. Notable for its fine cinematography and the god-awful timing of its release. In 2012, soon after Pacquiao announced that he had recommitted himself to God and Christianity, that he had given up drinking, gambling, and womanizing, and that he’d sold his stakes in vice-related industries like cockfighting and casinos, Hennessy released a slick new cognac commercial starring the fighter. The conflict was easy to explain — Pacquiao had filmed the ad before his spiritual awakening — but the minor flub also foreshadowed how Manny’s religious zeal would lead him to greater controversy in the future. After rubbing shoulders with so many politicians, it’s not all that surprising that Pacquiao eventually decided to join their ranks. But it is unfortunate, because the Philippine government’s track record over the past half-century has shown that the country’s institutions are far better at enriching elected officials than they are at addressing poverty and corruption. Even if you read the purest of intentions into Pacquiao’s political career, the odds remain stacked against him achieving lasting, positive change on the national level or in Sarangani, the province he has represented in Congress since 2010. If anything, it’s more likely that politics will tarnish his legacy and perhaps add a cautionary moral wrinkle to the Manny Pacquiao legend. For the time being, Pacquiao remains an inspirational sports hero to the wide majority of his countrymen. His flaws are common knowledge, but they can’t detract from the honor he’s brought the nation as a boxer. But he’s expected to run for senator in 2016, and the deeper Pacquiao wades into government, the more likely it is that his relatively pure public image will be twisted by the political realm’s hall of mirrors. He’s both a notorious tax evader and the country’s top taxpayer. He’s a deadbeat, absentee congressman to some of his legislative colleagues, but also a generous savior to his constituents. Politics, wherever it’s practiced, is a dirty, complicated business, and there’s no reason to believe Pacquiao won’t be smudged by it. When Pacquiao returned to the Philippines four days after his knockout loss to Marquez, he held a press conference at the airport and announced to the nation, “Babangon tayo ulit.” We will rise again. There was no way to know at the time, but those words would grow heavy with sorrow, purpose, and hope by the time Pacquiao returned to the ring, 11 months later, against Brandon Rios. Sixteen days before the Rios bout, Typhoon Haiyan, the strongest storm in recorded history, made landfall in the central Philippines and cut an unprecedented path of destruction across the nation. The worst damage was in Tacloban City, a provincial capital of more than 200,000 people, where Haiyan’s 20-foot storm surge engulfed and then washed away entire neighborhoods. The dead hadn’t been fully counted by the time Pacquiao stepped inside the ring to face Rios, but the toll would eventually pass 6,000. After Haiyan, “We will rise again” became a national refrain, and Pacquiao’s ability to bounce back from crushing defeat would serve as a metaphor for his wounded country’s need to rebuild and heal. Many boxing experts predicted Pacquiao would never return to peak form after the Marquez fight, but Pacquiao battered Rios, flashing enough speed, footwork, and power to make it clear that even a post-knockout, mid-thirties Manny could still be an elite fighter. Pacquiao proved he still belonged near the top of the sport in his next fight, when he avenged his 2012 loss to Timothy Bradley, who had just outpointed Marquez and was thought to be one of the best three pound-for-pound fighters in the world, along with Mayweather and Andre Ward. If Pacquiao still had it in him to beat Bradley, then he still deserved to be considered a top potential opponent for Mayweather. To bolster his case, Pacquiao tossed in a dominant, six-knockdown win over an outclassed Chris Algieri last November. And so we arrive at May 2. Manny’s “we will rise again” story line crested during the Rios fight, in the immediate aftermath of Typhoon Haiyan. But it’s possible to see the past two years of Pacquiao’s career as a more gradual ascent, leading to the challenge he and his country and much of the world have been waiting years for: Floyd Mayweather Jr. There was a stunning SportsCenter feature about how Pacquiao went into the ring against Toyogon the same night that he watched a friend and training partner die in the ring. Freddie Roach had already begun working with him by the time Pacquiao fought Ledwaba and Barrera, but the trainer’s lessons hadn’t yet led to much besides some improved upper-body movement. At this stage in his career, Pacquiao remained a straight-left specialist with no other elite weapon in his arsenal.